I looked up sky at night yesterday. Full moon was shining beautifully. There are my favorite songs for moon. Oborozukiyois an old Japanese song and my favorite one. Sky in spring in Japan is hazy. So moon seems to be hazy. Oborozukiyo means night like this. This song is so beautiful. I found a music video. Japanese female singer, Mika Nakashima sing the song. Another song ﻿is 今夜月の見える丘に. This song was theme song of TV drama, "Beautiful Life". that was on air about ten years ago. I'm happy to see beautiful moon now. It is sakura season now. Spring is a season of encounter and saying good-by in Japan. Japanese feel happy to see sakura every year. And we go to see sakura and have a party or festival under the trees. However, this year is different a little. Because we have a lot of problems and know various tragedy of this big earthquake. We can't imagine our future and feel depressing. 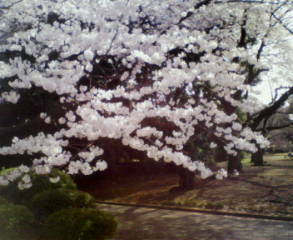 However, Sakura brooms every year and the beauty let us calm. 諸行無常 (Shogyomujo) in it is very famous phrase. It means impermanence. All of things and every moment is impermanent. I didn't know why we memorized at that time and I might not have understood the real meaning. I especially realize it now. There is a song of sakura that I love. The title is Sakura and this song is very beautiful. We especially hear it in graduation season. It was big hit song in Japan.